Types of Lights – Chesapeake Chapter U.S.L.H.S. 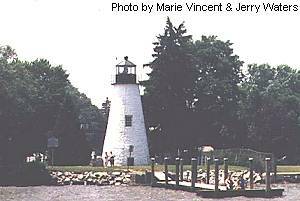 TOWER: The early Bay lighthouses were simple towers of brick or local stone with a light at the top. They were built near the shoreline or on a bluff so they could be seen by passing ships. Erosion of the shore caused by the weather threatened many of these towers. Some of the tower lights are Concord Point, Turkey Point, Piney Point, Cove Point, all in Maryland, and Old Cape Henry, New Cape Henry, Old Point Comfort and New Point Comfort in Virginia. SCREWPILE: Forty-two screwpiles were built on the Bay between 1850 and 1900. There were more screwpile lighthouses built on the Chesapeake Bay than anywhere in the world. Screwpiles were first developed by Alexander Mitchell who was a blind Irish marine engineer. Iron legs were screwed into the bottom of the Bay usually in a hexagonal pattern. A 1 1/2 story cottage for the keeper was built on top of this foundation, and a light was placed at the top. The legs of the foundation were protected from ice with piles of stones. Screwpiles were usually built on shoals or at the mouth of a river. Screwpile lights that were not destroyed by ice flows were torn down in the 1960s. Many of the iron bases are still used today for automated lights and fog signals. The remaining screwpile lights in the Chesapeake Bay area are Thomas Point Shoal (still at it’s original location), Seven Foot Knoll (only all-iron round screwpile; moved to Baltimore’s Inner Harbor), Hooper Strait (re-located at the Chesapeake Bay Maritime Museum in St. Michael, MD) and Drum Point (re-located at Calvert Marine Museum in Solomons, MD). CAISSON: In 1890, five screwpiles had burned or damaged by ice. The screwpiles began to be replaced with a new style lighthouse, a caisson. A caisson is a cast iron cylinder sunk deep into the bottom of the Bay and filled with heavy stones and concrete. The tower of iron or brick was then built on top of the caisson foundation. 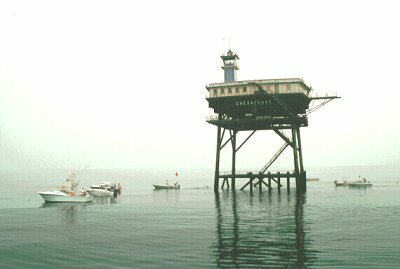 The first caisson lighthouse erected in the Chesapeake, and in the nation, was the Craighill Channel Lower Range Front Light. Caisson lighthouses were expensive to build but were very sturdy. All the caissons built on the Bay still survive. Some examples of the caisson style include Bloody Point Bar, Baltimore, Hooper Island, Point No Point, Sandy Point Shoal, Sharps Island, and Solomons Lump. INTREGAL: An “integral” lighthouse is a house with a light on it. Building an integral lighthouse is simple and no more expensive than building a house. Many early lighthouses were of this type. 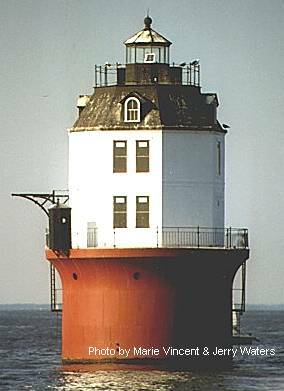 In 1852-1853 there was a movement to replace integral lights that were in poor repair with much taller tower type lighthouses. 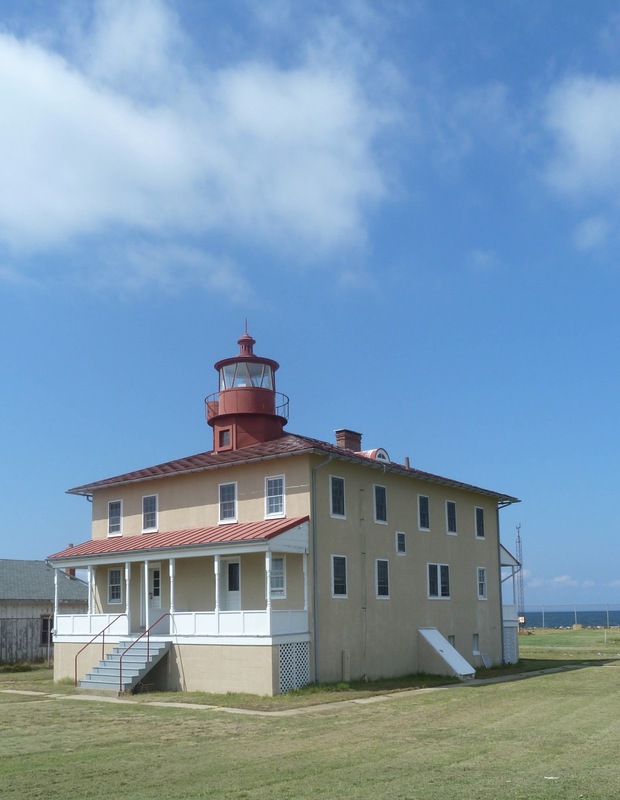 Today only two remain in the Chesapeake Bay area, Point Lookout Light and Fishing Battery Light. TEXAS TOWER:The “Texas” tower style lighthouses were adaptations modeled on the offshore oil drilling platforms first employed off the Texas coast. All are primarily made of steel. A total of six Texas tower lighthouses were constructed and only four survive. The Chesapeake Light Tower is the only one built in the Bay.